Cusco – the old inca town and now a small, pleasant city full of culture, traditions, and fun- is the place to spend your New Years Eve, not only for AMAUTA students learning Spanish in Peru but for many other travelers as well. The city of Cusco certainly is a magical place to be and many travellers come together here for New Years celebrations. But where to go? How do you know which is thé place to be to spend new Years Eve in Cusco? One of the most important Christmas events that you can visit if you Study Spanish in Peru these days, is the Santurantikuy Christmas market in Cusco. This important fair has been a Cusco Christmas Eve tradition for over 500 years and if you have the opportunity to visit you certainly should. 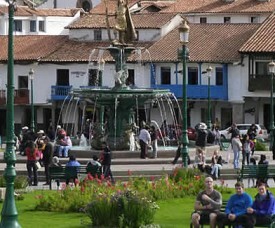 It is hard to miss anyway, as it takes place on the Plaza de Armas from early in the morning on. Santurantikuy begins around 4am on December 24th when the first artisans arrive with their colorful wares to peddle, and it lasts well into the evening of December 24th. “Santurantikuy” translates to the ‘Selling of the Saints’ in Quechua, the original language of the Peruvians and still spoken by many people in Cusco and other regions of Peru. Religious ceramics dominate the market, and according to the local artisans, they take about 6 months to hand craft perfectly. 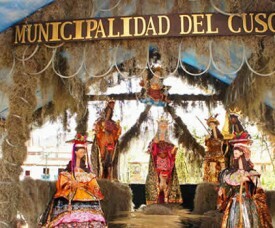 One of the deep-rooted custom in culture and Peruvian folklore, are the “nacimientos”: nativity scenes. The assembly of the nativity is a tradition that, at the beginning of the colonial stage, used to be an instrument for evangelization brought from Spain by the Congregation of the Jesuits. Throughout the years, each region in Peru started to develop it’s own ”nacimientos” based on typical elements of each region. A nativity in Cusco, for example, is very different from the typical ones from Lima or Ayacucho, where the nativities are called ‘retablos’. Each province has it’s own way to show their Christmas fervor. In the northern provinces of Peru the nativities are made our of mud; other provinces mix Inca and Spanish culture and incorporate elements from different periods. Also the “Ashaninkas” – the indigenous people of the jungle – have their own Christmas nativity scenes and rituals: the cribs are visited by little shepherds who sing Christmas carols to the Child. 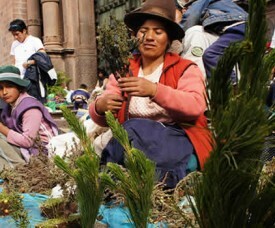 During the month of December, many public and private institutions in Cusco as well as other organizations organize Christmas Events out of solidarity with the less fornutate. Those solidarity Christmas parties are also called “chocolatadas” and they aim to bring a bit of Christmas includig hot chocolate, biscocho or “paneton” (a cake or sweet bread of Italian origine with raisins) to the people, and some Christmas toys for the children. Last Thursday, December 12 the donation of our volunteer Judith Eigeman became effective in the Gerontological Center “San Franciso de Asis” in Cusco. Judith, after having done volunteer work at this project earlier this year, had sent a donation of 100 euros. The AMAUTA Volunteer coordinator, in charge of all volunteer placements that also coordinates the support AMAUTA and the AMAUTA Volunteers give to the project, happily went to buy a blood pressure monitor together with the director of the Center. With a bit of extra money that was left, the Director could also buy “mazamorra” for all the people attending the center: mazamorra is one of Peru’s favorites maize-based desserts. 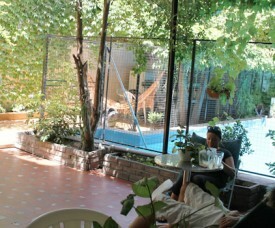 Accommodation is an important component of your Spanish studies with us in Buenos Aires (Argentina), or in Cusco (Peru). Therefore we select our options carefully. Learning Spanish will be so much easier when you feel at easy and comfortable where you are living. In Buenos Aires you can choose to live with a local Argentine host family, which is a great opportunity to get to know Argentine culture by sharing your daily life with Argentine people. Of course this very good to practice what you’ve learned in Spanish classes in real life situations. A great alternative for a family homestay, is to live in one of our comfortable and conveniently located student residences in buenos Aires.